Epitopes of phospholipase A2 receptor (PLA2R), the target antigen in idiopathic membranous nephropathy (iMN), must be presented by the HLA–encoded MHC class II molecules to stimulate autoantibody production. A genome–wide association study identified risk alleles at HLA and PLA2R loci, with the top variant rs2187668 within HLA-DQA1 showing a risk effect greater than that of the top variant rs4664308 within PLA2R1. How the HLA risk alleles affect epitope presentation by MHC class II molecules in iMN is unknown. Here, we genotyped 261 patients with iMN and 599 healthy controls at the HLA-DRB1, HLA-DQA1, HLA-DQB1, and HLA-DPB1 loci with four-digit resolution and extracted the encoded amino acid sequences from the IMGT/HLA database. We predicted T cell epitopes of PLA2R and constructed MHC-DR molecule-PLA2R peptide-T cell receptor structures using Modeler. We identified DRB1*1501 (odds ratio, 4.65; 95% confidence interval [95% CI], 3.39 to 6.41; P<0.001) and DRB1*0301 (odds ratio, 3.96; 95% CI, 2.61 to 6.05; P<0.001) as independent risk alleles for iMN and associated with circulating anti–PLA2R antibodies. Strong gene-gene interaction was noted between rs4664308(AA) and HLA-DRB1*1501/DRB1*0301. Amino acid positions 13 (P<0.001) and 71 (P<0.001) in the MHC-DRβ1 chain independently associated with iMN. Structural models showed that arginine13 and alanine71, encoded by DRB1*1501, and lysine71, encoded by DRB1*0301, facilitate interactions with T cell epitopes of PLA2R. In conclusion, we identified two risk alleles of HLA class II genes and three amino acid residues on positions 13 and 71 of the MHC-DRβ1 chain that may confer susceptibility to iMN by presenting T cell epitopes on PLA2R. HLA locus is considered the most complex one in human genome. In a joint GWAS study performed by Stanescu et al.2 in three different populations of white European patients, 282 single-nucleotide polymorphisms (SNPs) within HLA locus (chromosome 6) presented significant associations with iMN. SNP rs2187668 within HLA-DQA1 was the most significant one.2 Because each amino acid residue on MHC is typically assigned to multiple HLA classic alleles, the disease risk effect at certain amino acid positions would go undetected if only HLA classic alleles and single SNPs were assessed.4–7 Thus, additional genetic and pathogenic investigations on HLA protein–coding alleles are urgently warranted. PLA2R1 is a 180-kD membrane receptor with a large extracellular region comprising ten distinct domains, namely a cysteine-rich domain (CysR), a fibronectin type II domain, and eight distinct C–type lectin domains (CTLDs; CTLD1–CTLD8).8 Several epitopes on PLA2R1 targeted by anti-PLA2R1 antibodies were revealed recently.9 Kao et al.10 first located the immunodominant epitope in the CysR-fibronectin type II domain-CTLD1 region. Fresquet et al.11 further identified two peptides from the ricin domain, with a longer sequence covering both peptides (31-mers) producing 85% inhibition of autoantibody binding to PLA2R. 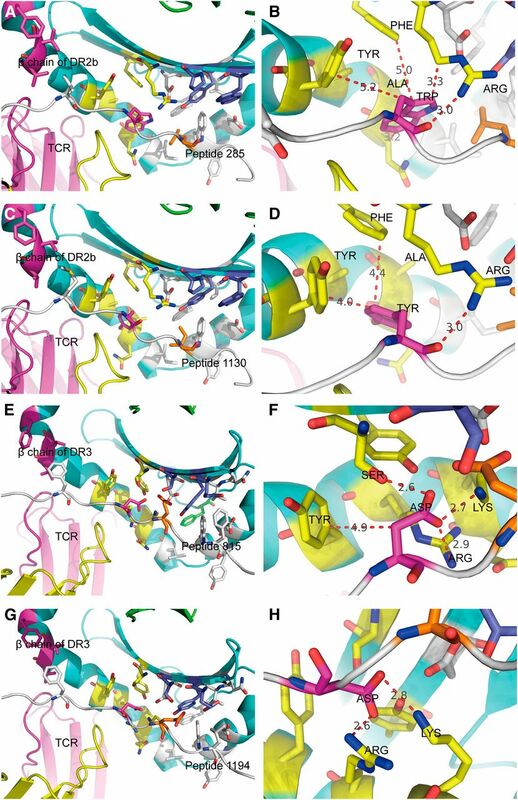 Seitz-Polski et al.12 recently identified reactive epitopes in CysR, CTLD1, and CTLD7 domains. CysR appears as the primary dominant epitope, with evidence for epitope spreading toward CTLD1 and CTLD7. However, which epitopes and how they are presented by MHC class II molecules are not elucidated. In this study, we thoroughly investigated the HLA class II gene profile at four-digit resolution from 261 patients with iMN and 599 ethnically matched controls and explored the iMN-HLA associations with alleles, haplotypes, amino acid positions, and residues. With this line of evidence, we further propose models for the presentation of PLA2R epitopes by susceptible HLA alleles, which strongly supports a causative link between the presence of HLA risk alleles and the development of PLA2R antibodies and iMN. The patient group comprised 261 patients with biopsy-proven iMN. Patients with secondary causes, such as infections, like hepatitis B and hepatitis C virus, syphilis, lupus, malignancy, and heavy metal poisoning, were excluded. Circulating anti–PLA2R antibodies were assessed in all patients at the time of renal biopsy, with a positive rate of 66.3%. Clinical and pathologic characteristics of patients with iMN are shown in Supplemental Table 1. The control group comprised 599 healthy, voluntarily recruited blood donors. All participants were self–reported Chinese Han living in the north of China. Using sequencing-based typing, we have successfully genotyped 142 classic HLA alleles at four-digit resolution, including 47 DRB1, 19 DQA1, 21 DQB1, and 55 DPB1 alleles. P value of <0.001 was adopted as the threshold for statistical significance in classic HLA allele association analysis. Association results are shown in Supplemental Table 2. Unconditional association analysis revealed a significantly positive association between iMN and DRB1*1501, DQB1*0602, DRB1*0301, and DQA1*0102 and a significantly negative association between iMN and DRB1*0901, DQB1*0303, DQA1*0301, and DQA1*0302 (Figure 1A, Table 1). Stepwise conditional analysis revealed that, after adjusting for DRB1*1501, the most significant association was observed with DRB1*0301 (P<0.001) (Figure 1B). After controlling for DRB1*0301, similarly, DRB1*1501 showed significant positive association with the disease (P<0.001). Thus, DRB1*1501 and DRB1*0301 were two independent risk HLA alleles for iMN. However, when we controlled for DRB1*1501 and DRB1*0301, no HLA allele showed significant association with the disease (Figure 1C). Associations of HLA class II alleles with iMN. (A) Association results for HLA class II alleles analysis in Chinese patients with iMN. (B) After adjusting for DRB1*1501, DRB1*0301 still showed significantly positive association with iMN. (C) After adjusting for both DRB1*1501 and DRB1*0301, no HLA allele showed significant association with iMN. In our patients, 73.6% (192 of 261) carried DRB1*1501 or DRB1*0301, whereas in healthy controls, only 33.1% (198 of 599) carried DRB1*1501 or DRB1*0301 (chi squared =120.4; P<0.001). Thirteen percent (34 of 261) of the patients carried both DRB1*1501 and DRB1*0301, whereas only 0.7% (four of 599) of the healthy individuals did so (chi squared =65.7; P<0.001). The top SNP rs2187668 in HLA-DQA1, which is known as the tag SNP of DRB1*0301, was in moderate linkage disequilibrium (LD) with DRB1*0301 (r2=0.46, D′=0.73) in our population; 79.2% of the patients having rs2187668(A) carried DRB1*0301. Although unconditional association analysis showed a significantly positive association between rs2187668(A) and iMN (odds ratio [OR], 1.94; 95% confidence interval, 1.09 to 3.45; P=0.03), stepwise conditional analysis revealed that rs2187668(A) lost its association with iMN (P=0.60) after adjusting for DRB1*0301. Because the HLA region contains the densest LD in the human genome, LD was analyzed among the four susceptible alleles that we had identified (Table 2). DRB1*0301 was in low LD with DQB1*0602 (D′=0.56, r2=0.01) and DQA1*0102 (D′=0.89, r2=0.02). In contrast, the other three susceptible alleles (DRB1*1501, DQB1*0602, and DQA1*0102) were in overt LD. The association of HLA DR-DQ haplotypes with iMN was analyzed using the expectation-maximization algorithm via the R Project. Three hundred thirty distinct HLA DR-DQ haplotypes were found in patients and healthy controls, and therefore, we set P<0.05/330 (<0.001) as the threshold for statistical significance. DRB1*1501-DQA1*0102-DQB1*0602 haplotype showed the strongest risk association with iMN (score =8.80; P<0.001). DRB1*0301-DQA1*0501-DQB1*0201 haplotype was another risk haplotype for iMN (score =6.85; P<0.001) (Table 3). DRB1*0901-DQA1*0302-DQB1*0303 haplotype also showed association with iMN (score =−5.37; P<0.001) but with opposite effect (Table 3). The amino acid residues of MHC-DRβ1, -DQα1, -DQβ1, and -DPβ1 chains were analyzed for potential associations with iMN. We successfully imputed 307 polymorphic amino acid positions among DRβ1, DQα1, DQβ1, and DPβ1 on the basis of the corresponding HLA class II alleles at four-digit resolution. Thus, P value of <0.001 was adopted as the threshold for statistical significance. Unconditional analysis revealed that the most significant association was mapped to the amino acid position 13 on MHC-DRβ1 chain encoded by exon 2 of HLA-DRB1 (P<0.001) (Figure 2A). The amino acid residue on position 13 participates in the formation of a β-sheet in the fourth peptide–binding pocket of MHC-DRβ1 chain (Figure 3). Among the six possible amino acid residues, arginine (ARG), tyrosine (TYR), histidine, serine, glycine, and phenylalanine (PHE), at this position, ARG13 showed a risk effect for iMN (OR, 2.89; P<0.001), whereas PHE13 showed a protective effect (OR, 0.24; P<0.001). The other four residues had no significant effect (Figure 4, Table 4). Associations of MHC class II molecules with iMN. (A) Unconditional analysis results showed that amino acid positions 13 and 71 on HLA-DRβ1 were most significantly associated with iMN risk. (B) After adjusting for amino acid position 13, position 71 still showed significant association with the disease. (C) After adjusting for amino acid position 71, position 13 still showed significant association with the disease. (D) After adjusting for both positions 13 and 71, no amino acid position showed significant association with iMN. 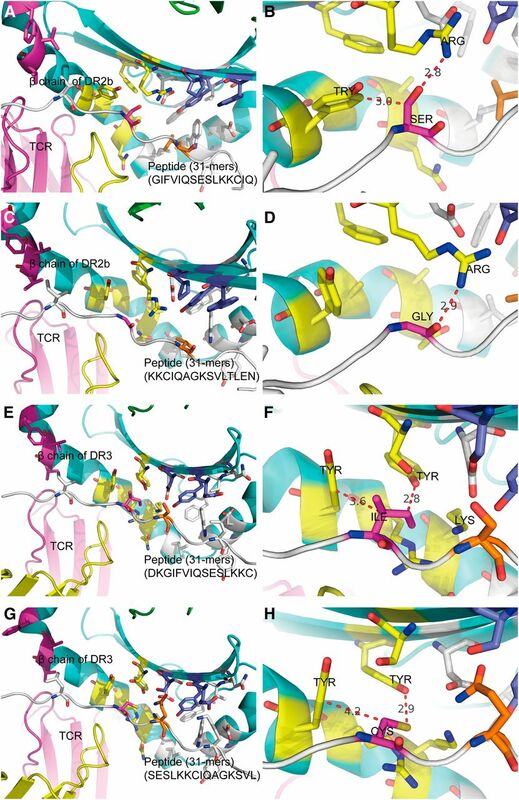 Three–dimensional ribbon models for the risk HLA-DR molecules. Amino acid position 71 of HLA-DRβ chain is located on peptide-binding pockets 4 and 7, and amino acid position 13 is located on peptide-binding pocket 4. (A) HLA-DR2b: the structure is on the basis of Protein Data Bank entry 1BX2. The α- and β-chains are encoded by HLA-DRA*0101 and DRB1*1501, respectively, with a direct view of the peptide-binding groove. ALA71 (blue) and ARG13 (orange) were identified through association analysis. (B) HLA-DR3: the structure is on the basis of Protein Data Bank entry 1A6A. The α- and β-chains are encoded by HLA-DRA*0101 and DRB1*0301, respectively, with a direct view of the peptide-binding groove. LYS71 (yellow) and serine13 (green) are highlighted. Effects of individual amino acid residue at positions 13 and 71 on HLA-DRβ1. The amino acid residue frequencies of positions 13 and 71 on HLA-DRβ1 in the patients and controls are plotted, and the univariate ORs are indicated. GLY, glycine; HIS, histidine; SER, serine. A similar level of significance (P<0.001) was observed for the amino acid residue on position 71 in the MHC-DRβ1 chain (Figure 2A). This amino acid residue forms part of an α-helix in the fourth and seventh peptide–binding pockets of MHC-DRβ1 chain (Figure 3). Four possible amino acid residues, alanine (ALA), lysine (LYS), glutamic acid (GLU), and ARG, were identified at this position. LYS71 (OR, 2.76; P<0.001) and ALA71 (OR, 3.09; P<0.001) showed risk effects for iMN. ARG71 showed a protective effect (OR, 0.31; P<0.001). GLU had no significant association with the disease (Figure 4, Table 4). After adjusting for position 13, position 71 still showed significant effects for iMN (P<0.001) (Figure 2B). Conversely, after adjusting for position 71, position 13 still had an effect (P<0.001) (Figure 2C). Thus, positions 13 and 71 on DRβ1 chain were independently at risk for iMN. After adjusting for both positions 13 and 71, there was no additional association signal for the amino acid positions on MHC-DRβ1, -DQα1, -DQβ1 and -DPβ1 chains (Figure 2D). ALA71 and ARG13 are encoded by DRB1*1501 allele, and LYS71 is encoded by DRB1*0301 allele (Table 4); 81.67% of the patients carried at least one of these three susceptible amino acid residues compared with 42.07% of the healthy individuals (chi squared =114.44; P<0.001). The two protective amino acid residues ARG71 and PHE13 are encoded by DRB1*0901 (Table 4); 10.34% of the patients carried this combination compared with 35.23% of the healthy individuals (chi squared =56.22; P<0.001). We selected rs4664308 located in the first intron of PLA2R1, which was reported to be strongly associated with iMN in the white GWAS study2 and our Beijing Asian population study.3 Gene-gene interaction analyses were performed between rs4664308 and HLA-DRB1*1501/DRB1*0301 (Table 5). The combination of risk genotypes of rs4664308 and HLA-DRB1*1501 [rs4664308(AA) + DRB1*1501(+)] conferred a 32.40-fold higher risk (P<0.001) for the development of iMN compared with the protective genotype at both loci. The combination of risk genotypes of rs4664308 and HLA-DRB1*0301 [rs4664308(AA) + DRB1*0301(+)] conferred a 29.95-fold higher risk (P<0.001) for the development of iMN compared with the protective genotype at both loci. Both rs3749117 and rs35771982, encoding the nonsynonymous amino acids M292V and H300D of PLA2R, respectively, also showed interaction with DRB1*1501/DRB1*0301 (Supplemental Tables 3 and 4). In patients with circulating anti–PLA2R antibodies, DRB1*1501 (OR, 6.06; P<0.001) and DRB1*0301 (OR, 4.92; P<0.001) showed high risk effects for the disease. In patients without anti-PLA2R antibodies, DRB1*1501 (OR, 3.14; P<0.001) still showed positive association with iMN, albeit to a much lower level of significance, but DRB1*0301 (OR, 2.54; P=0.35) lost its risk effect (Table 6). In the patients carrying DRB1*1501 or DRB1*0301, the prevalence of anti-PLA2R antibody was higher (72.10%) than in those without these susceptible alleles (50.00%; chi squared =10.95; P=0.001). ARG13, ALA71, and LYS71, three susceptible amino acid residues on MHC-DRβ1, also showed positive association with the presence of circulating anti–PLA2R antibodies (chi squared =9.75; P=0.002). In patients carrying ARG13, ALA71, or LYS71, 71.30% of the patients had positive circulating anti–PLA2R antibodies. In contrast, only 48.21% of the patients without these amino acid residues developed circulating anti–PLA2R antibodies. We used SYFPEITHI online database to predict T cell epitopes on the extracellular domain (amino acid residues 21–1397) of PLA2R presented by DRB1*1501.13 Peptide 285 in CTLD1 domain and peptide 1130 in CTLD7 domain were the best fitting peptides, with equal scores of 34 (Table 7). MHC class II molecule DR2b is encoded by DRB1*1501 and DRA*0101. The structural models of DR2b-peptide 285 (SKTVEVWMGLNQLDE)-TCR were constructed using the Modeler program.14–17 The optimum structure is shown in Figure 5A. In this model, the amino acid residues of peptide 285, valine288, tryptophan291, glycine293, leucine294, and glutamine296, are presented in the peptide-binding pockets 1, 4, 6, 7, and 9, respectively, of DR2b (Table 7). ALA71 in DR2b β-chain makes pocket 4 larger than that in other MHC DR molecules, so that the indole ring of tryptophan291 can stretch into this pocket. Distance between the guanidino nitrogen atom of ARG13 and the carbonyl oxygen atom of tryptophan291 backbone in pocket 4 is 3.0 Å, which facilitates the formation of hydrogen bond. Furthermore, tryptophan291 and PHE26 and TYR78 in pocket 4 form strong hydrophobic interactions with each other (Figure 5B). Structural models of MHC class II-PLA2R peptide-TCR molecule. Gray cartoon is peptide, cyan cartoon is MHC DR molecule, and magenta cartoon is TCR molecule. Magenta sticks are amino acid residues of pocket 1, yellow sticks are amino acid residues of pocket 4, blue sticks are amino acid residues of pocket 6, gray sticks are amino acid residues of pocket 7, and white sticks are amino acid residues of pockets 9. The distance between amino acid residues is shown by red dotted lines, and the unit is Angstroms. (A) Overall structure of the DR2b-peptide 285 (SKTVEVWMGLNQLDE)-TCR molecule. Valine288, tryptophan291, glycine293, leucine294, and glutamine296 are presented in pockets 1, 4, 6, 7, and 9, respectively. (B) Tryptophan291 is in pocket 4. ALA71 in DR2b β-chain makes pocket 4 larger than in other MHC DR molecules, so that the indole ring of tryptophan291 can stretch into this pocket. Distance between the guanidino nitrogen atom of ARG13 and the carbonyl oxygen atom of tryptophan291 backbone in pocket 4 is 3.0 Å, which facilitates the formation of hydrogen bond. Furthermore, tryptophan291 and PHE26 and TYR78 in pocket 4 form strong hydrophobic interactions with each other. (C) Overall structure of the DR2b-peptide 1130(NANMTWYAAIKTCLM)-TCR molecule. Methionine1133, tyrosine1136, alanine1138, isoleucine1139, and threonine1141 are presented by pockets 1, 4, 6, 7, and 9, respectively. (D) Tyrosine1136 is in pocket 4. ALA71 makes pocket 4 larger and accommodates the phenyl ring of TYR1136 stretching into this pocket. Distance between the oxygen atom of TYR1136 and the guanidino nitrogen atom of ARG13 is 3.0 Å, which facilitates hydrogen bond formation. TYR1136 and PHE26 and TYR78 of pocket 4 produce strong hydrophobic interactions with each other. (E) Overall structure of the DR3-peptide 815(PWLFYQDAEYLFHTF)-TCR molecule. Phenylalanine818, aspartic acid821, glutamic acid823, tyrosine824, and phenylalanine826 are located in pockets 1, 4, 6, 7, and 9, respectively. (F) Aspartic acid821 is in pocket 4. The amidogen nitrogen atom of LYS71 and the guanidino nitrogen atom of ARG74 of DR3 β-chain interact with the carboxyl oxygen atom of aspartic acid821 on peptide 815 at distances of 2.7 and 2.9 Å, respectively. (G) Overall structure of the DR3-peptide 1194(SFTFWKDEESSLLGD)-TCR molecule. Phenylalanine1197, aspartic acid1200, glutamic acid1202, serine1203, and leucine1205 are presented in pockets 1, 4, 6, 7, and 9, respectively. (H) Aspartic acid1202 is in pocket 4. The amidogen nitrogen atom of LYS71 and the guanidino nitrogen atom of ARG74 of DR3 β-chain interact with the carboxyl oxygen atom of aspartic acid1200 at distances of 2.8 and 2.6 Å, respectively. The structural models of DR2b-peptide 1130 (NANMTWYAAIKTCLM)-TCR were also constructed. The optimum structure is shown in Figure 5C. The amino acid residues, methionine1133, tyrosine1136, alanine1138, isoleucine1139, and threonine1141, are presented by pockets 1, 4, 6, 7, and 9, respectively, of DR2b molecule (Table 7). ALA71 makes pocket 4 larger and accommodates the phenyl ring of tyrosine1136 stretching into this pocket. Distance between the oxygen atom of tyrosine1136 and the guanidino nitrogen atom of ARG13 is 3.0 Å, which facilitates hydrogen bond formation. tyrosine1136 and PHE26 and TYR78 of pocket 4 produce strong hydrophobic interactions with each other (Figure 5D). We also predicted two peptides defining potential PLA2R epitopes presented by DRB1*0301, with equal scores of 33. Peptide 815 is located between CTLD4 and CTLD5 domains, and peptide 1194 is in CTLD7 domain (Table 7). MHC molecule DR3 is encoded by DRB1*0301 and DRA*0101. DR3-peptide 815 (PWLFYQDAEYLFHTF)-TCR structural models were constructed and screened, with the optimum structure shown in Figure 5E. Phenylalanine818, aspartic acid821, glutamic acid823, tyrosine824, and phenylalanine826 are located in pockets 1, 4, 6, 7, and 9, respectively, of DR3 molecule (Table 7). The amidogen nitrogen atom of LYS71 and the guanidino nitrogen atom of ARG74 of DR3 β-chain interact with the carboxyl oxygen atom of aspartic acid821 on peptide 815 at distances of 2.7 and 2.9 Å, respectively (Figure 5F). The optimum structure of DR3-peptide 1194 (SFTFWKDEESSLLGD)-TCR is shown in Figure 5G. Phenylalanine1197, aspartic acid1200, glutamic acid1202, serine1203, and leucine1205 are presented in pockets 1, 4, 6, 7, and 9, respectively, of DR3 molecule (Table 7). The amidogen nitrogen atom of LYS71 and the guanidino nitrogen atom of ARG74 of DR3 β-chain interact with the carboxyl oxygen atom of aspartic acid1200 at distances of 2.8 and 2.6 Å, respectively (Figure 5H). Peptide WQDKGIFVIQSESLKKCIQAGKSVLTLENCK, corresponding to the amino acid sequences 35–65, was reported as a major antibody–binding peptide of PLA2R in the N–terminal CysR domain.11 We used the SYFPEITHI database to predict the epitopes presented by DR2b and DR3 molecules on this immunodominant peptide. We identified two potential T cell epitopes with equal scores of 24 for DRB1*1501, GIFVIQSESLKKCIQ and KKCIQAGKSVLTLEN, and two possible T cell epitopes with equal scores of 18 for DRB1*0301, DKGIFVIQSESLKKC and SESLKKCIQAGKSVL, which overlapped with those predicted for DRB1*1501. Results are shown in Figure 6 and Table 7. Structural models of MHC class II-peptide (WQDKGIFVIQSESLKKCIQAGKSVLTLENCK)-TCR molecule. Gray cartoon is peptide, cyan cartoon is MHC DR molecule, and magenta cartoon is TCR molecule. Magenta sticks are amino acid residues of pocket 1, yellow sticks are amino acid residues of pocket 4, blue sticks are amino acid residues of pocket 6, gray sticks are amino acid residues of pocket 7, and white sticks are amino acid residues of pockets 9. The distance between amino acid residues is shown by red dotted lines, and the unit is angstroms. (A) Overall structure of the DR2b-peptide(GIFVIQSESLKKCIQ)-TCR molecule. Valine42, serine45, serine47, leucine48, and lysine50 are presented in pockets 1, 4, 6, 7, and 9, respectively. (B) Serine45 is in pocket 4. Distance between the oxygen atom of the serine side chain and the guanidino nitrogen atom of ARG13 on DR2b β-chain is 2.8 Å, which facilitates the formation of hydrogen bond. Serine45 and PHE26 and TYR78 of pocket 4 also produce strong hydrophobic interactions with each other. (C) Overall structure of DR2b-peptide(KKCIQAGKSVLTLEN)-TCR. Isoleucine52, glycine55, serine57, valine58, and threonine60 are presented in pockets 1, 4, 6, 7, and 9, respectively. (D) Glycine55 is in pocket 4. The distance between the oxygen atom of glycine55 main chain and the guanidino nitrogen atom of ARG13 on DR2b β-chain was 2.9 Å, which facilitates hydrogen bond formation. (E) Overall structure of DR3-peptide(DKGIFVIQSESLKKC)-TCR. Isoleucine40, isoleucine43, serine45, glutamine46, and leucine48 are presented in pockets 1, 4, 6, 7, and 9, respectively. (F) Isoleucine43 is in pocket 4. Isoleucine43 interacts with PHE26 and TYR78 through hydrophobic interaction. (G) Overall structure of DR3-peptide(SESLKKCIQAGKSVL)-TCR. Leucine48, cystine51, glutamine53, alanine54, and lysine56 are presented in pockets 1, 4, 6, 7, and 9, respectively. (H) Cystine51 is in pocket 4. Cystine51 interacts with PHE26 and TYR78 through hydrophobic interaction. Using the SYFPEITHI database, we also assessed the sequence variants of PLA2R1, including D200Y, M292V, H300D, R387H, R387C, R404H, Y499C, V680L, L687P, and G1106S.18 The predicted T cell epitopes of PLA2R presented by DR2b or DR3 did not change after the one by one amino acid substitution. Amino acid substitution of M292V in peptide 285 [SKTVEVW(M/V)GLNQLDE] did not influence the presentation modeling by DR2b. The structure of DR2b-peptide 285 with the V substitution [SKTVEVW(V)GLNQLDE]-TCR is shown in Supplemental Figure 1. We found that DRB1*1501 allele and its haplotype DRB1*1501-DQA1*0102-DQB1*0602 showed the strongest association with iMN. Two risk amino acid residues, ALA71 and ARG13 of HLA-DRβ1, were also positively associated with the presence of circulating anti–PLA2R antibodies. These findings are consistent with the results of old studies in Japanese patients,6,7 whereas in whites, DRB1*1501 was not found to be associated with iMN.4,5 We speculate that ethnic disparity may contribute to this difference. DRB1*1501 is a common risk allele for many autoimmune diseases, like Goodpasture disease, multiple sclerosis, pemphigus vulgaris, and SLE.19–21 DRB1*1501 still showed positive association with patients without anti-PLA2R antibodies, which suggests that DRB1*1501 may also present non-PLA2R epitopes involved in the pathogenesis of iMN. DRB1*0301 allele and its bearing haplotype DRB1*0301-DQA1*0501-DQB1*0102 were also at high risk for iMN. LYS71 of β-chain of DR3 molecule encoded by DRB1*0301 was identified as a risk amino acid residue for this disease. In the patients with anti-PLA2R antibodies, DRB1*0301 remained strongly associated with the disease, and LYS71 was also confirmed as a risk amino acid residue, whereas in those without anti-PLA2R antibodies, DRB1*0301 association lost significance, which may suggest that this allelotype is mostly associated with PLA2R-related iMN. The identification of DRB1*0301 as a major risk allele is consistent with the previous GWAS study, which identified the top SNP rs2187668 (A/G) within HLA-DQA1,2 because rs2187668(A) is the tag SNP of DRB1*0301.20,22 After adjusting for DRB1*0301, rs2187668(A) lost its association with iMN, which indicates that DRB1*0301 may account for the majority or even all of the association signal of rs2187668(A). Our results are also in agreement with those of old serologic studies, which showed that the HLA-B8/DR3 serotype (corresponding to the haplotype HLA-B*0801-DRB1*0301-DQA1*0501-DQB1*0102) was associated with the occurrence of iMN in whites.4,5,23 HLA-B8/DR3 haplotype was also associated with high production of TNF-α in vivo and in vitro,24 which suggests that the increased spontaneous release of TNF-α might participate in the onset of iMN. The major function of HLA class IIgene complex is speculated to encode protein products within MHC class II molecules and participate in the immune system by presenting antigens mostly to T lymphocytes. The multiplication of T-helper cells, in turn, stimulates antibody–producing B cells to release antibodies to those specific antigens. Strong gene-gene interactions were identified between rs4664308(A) (top intronic SNP within PLA2R1) and HLA-DRB1*1501/DRB1*0301. It is remarkable that rs3749117 and rs35771982, which code for nonsynonymous substitution in the CTLD1 domain of PLA2R where lie both B cell and T cell (peptide 285) epitopes, also showed interactions with HLA-DRB1*1501/DRB1*0301. Close associations were also shown between circulating anti–PLA2R antibodies and DRB1*1501/DRB1*0301. As a whole, these data suggest a major role for HLA-DRB1*1501/DRB1*0301 in the pathogenesis of iMN through T cell epitope presentation. The molecular analysis at the amino acid level presented in this study should give new impetus to the search for mimicking sequences among antigens of microbial or other environmental origin. Molecular mimicry between these external antigens and PLA2R could lead to production of anti-PLA2R antibodies in patients genetically predisposed to autoimmunity and might well account for the increasing incidence of iMN worldwide. Alternatively, immunization could be due to the unmasking of hidden cryptic epitopes undergoing conformational changes on exposure to toxic environmental factors. A distinguishing feature of HLA-DR2b encoded by DRB1*1501 is a large, primarily hydrophobic pocket 4 of peptide-binding sites, which accommodates aromatic amino acids.25,26 This large space is mostly created by ALA71 of DR2b β-chain.27 The benzene ring of critical amino acid residues, tryptophan291 in PLA2R peptide 285 and tyrosine1136 in PLA2R peptide 1130, is just in the large pocket 4 of DR2b molecules. The guanidino nitrogen atom of another risk amino acid residue, ARG13, facilitates the formation of hydrogen bond with the oxygen atom of tryptophan291 and tyrosine1136. In the two PLA2R peptides 815 and 1194 presented by the susceptible allele DRB1*0301, the critical amino acid residues, aspartic acid821 and aspartic acid1200, interact with LYS71 and ARG74 on pocket 4 of DR3 β-chain. This interaction occurs through the carboxyl oxygen atom of aspartic acid on the one hand and the amidogen nitrogen atom of LYS71 and the guanidino nitrogen atom of ARG74 encoded by DRB1*0301 on the other hand. Although the CysR domain did not show up as potential T cell epitope in this study on the basis of sequence analysis of the most significantly associated allelotypes, we modeled interaction of risk alleles with a longer peptide (31-mers) in the CysR domain, because this peptide was recently characterized as producing 85% inhibition of autoantibody binding to PLA2R.11 Several interactions were identified, notably in pocket 4. In particular, the amino acid residues, isoleucine43 and cystine51, in the 31-mer peptide could interact with two TYRs encoded by DRB1*0301 (at positions 26 and 78 of DR3 β-chain) through hydrophobic interaction, albeit with a relatively low presenting score. DRB1*1501 and DRB1*0301 are two independent risk HLA alleles for iMN. The structure of HLA-DR2b and DR3 and the risk amino acid residues at positions 13 and 71 of DRβ1 are entirely different. For PLA2R antigen presentation, DRB1*1501 and DRB1*0301 may present different epitopes under different antigen presentation modes. Consequently, the mechanisms for DRB1*1501 and DRB1*0301 contributing to the onset of iMN might be different, which will need further investigations. This study has several genetic weaknesses. Because of the relatively small sample size of patients and controls, this study was not powered to detect association signals for rare alleles. Although >95% of the patients were from north China, there is genetic heterogeneity among these populations,28 which could not be addressed by genetic ancestry assessment in this study. One must be aware that subtle stratification even with closely related Han Chinese may introduce serious confounding in case-control analyses of this region. The lack of independent replication is another limitation to the study. However, several studies corroborate the association with DRB1*1501 in the Japanese population6,7 and DRB1*0301 in the white European population.23 We focused on a single top SNP (rs2187668) in HLA-DQA1, because of the 282 associated SNPs in the HLA region identified in the white European population,2 only a few among the top SNPs were conserved in the Chinese population.3 Additional studies should include a fine mapping of the HLA region in the Chinese to provide a more comprehensive picture of the genetic associations. Because search for PLA2R antigen could not be performed in biopsies, it is likely that the true prevalence of PLA2R-related iMN was underestimated.29 Lastly, structural models were on the basis of the identification of T cell epitopes predicted from the SYFPEITHI online database and constructed using the Modeler program. The predicted epitopes and critical amino acid residues need further investigations on the basis of ELISPOT analysis and amino acid mutation experiments. However, these findings provide useful information for subsequent epitope mapping studies and mimicry analyses. In conclusion, our study identified two independent risk alleles, HLA-DRB1*1501 and -DRB1*0301, and their bearing haplotypes for iMN onset. The association between risk HLA alleles and the presence of circulating anti–PLA2R antibodies was also confirmed. Risk amino acid residues on positions 13 and 71 at peptide-binding pocket 4 of HLA-DRβ1 may confer susceptibility to iMN by critically contributing to the presentation of the possible T cell epitopes on PLA2R. This study provides a first step toward a PLA2R-HLA-DR fitting model, which will need further investigations, because this approach may reveal key events in the pathogenesis. A total of 860 participants, comprising 261 patients with biopsy-proven iMN and 599 racially matched healthy controls, were enrolled in this study. All of the participants were of Chinese Han ethnicity. Birth places of all patients were checked by their national identification number: 96.6% (252 of 261) of the patients were from north China (Beijing, 55.9%; Hebei, 16.5%; Shanxi, 9.1%; inner Mongolia, 4.6%; Liaoning, 2.7%; Shandong, 2.3%; Henan, 2.3%; Heilongjiang, 1.5%; Tianjin, 0.8%; and Jilin, 0.8%), 1.1% (three of 261) of the patients were from south China (Guizhou, 0.8%; and Guangxi, 0.4%), and 2.3% (six of 261) of the patients were from central China (Anhui, 1.9%; and Hubei, 0.4%). All of the controls came from the Beijing area. The diagnosis of iMN was established by exclusion of secondary causes, such as hepatitis B and hepatitis C virus infections, SLE, malignancy, drugs, and heavy metal poisoning. This study was performed in compliance with the Declaration of Helsinki and approved through the ethics committee of Peking University First Hospital. Written informed consent was obtained from all participants. Serum samples from all patients were collected on the day of renal biopsy. Circulating anti–PLA2R autoantibodies were detected by a direct immunofluorescence assay with the use of the human embryonic kidney cell line that was transiently transfected with full-length cDNA encoding a PLA2R1 isoform (FA1254–1005–50; EUROIMMUN AG, Lubeck, Germany). The detection was performed on an immunofluorescence assay Mosaic slide following the standard instructions.3,30 Antibody positivity was defined as a green staining on the cells at the serum dilutions ≥1/10. Peripheral blood samples (10 ml) were collected from patients and controls with anticoagulant EDTA. Genomic DNA was isolated from peripheral whole blood using the Puregene Blood Core Kit C (catalog no. 158389; QIAGEN Science). HLA class II genes were typed on an Applied Biosystems Incorporated Company 3130XL platform using SeCoreTM Sequencing Kits (Invitrogen, Brown Deer, WI). Sequencing analysis software was used to process the raw data and generate the sequence files. Allele typing reports were issued using uType SBT HLA software. The typing of DRB1 alleles was performed through the bidirectional sequencing of exon 2, the typing of DQB1 was performed through the bidirectional sequencing of exons 2 and 3, and the typing of DPB1 was performed through the bidirectional sequencing of exons 2–4. For DQA1 typing, the alleles were typed using electrophoresis. All 199 patients with iMN and 398 healthy controls with sufficient DNA samples were genotyped by PCR Sanger sequencing technology. The sequence was detected by an Applied Biosystems Incorporated Company 3730XL DNA Analyzer. On the basis of four–digit resolution HLA alleles, we extracted amino acid sequences of the DRβ1, DQα1, DQβ1, and DPβ1 chains from the IMGT/HLA public database: http://www.ebi.ac.uk/ipd/imgt/hla/. Unconditional analysis and stepwise conditional analysis for HLA class II alleles and amino acid positions of HLA-DRβ1, DQα1, DQβ1, and DPβ1 were performed through logistic regression using PLINK software version 1.9 (http://zzz.bwh.harvard.edu/plink/).31 Haplotypes of HLA class II alleles were constructed using the expectation-maximization algorithm with the R project 3.1.1 (Haplo.Stats package; http://www.r-project.org).32 Differences were considered significant when the P value was <0.05 for distinct alleles, distinct haplotype, or distinct amino acid positions. The markers were obtained and encoded to determine the association analysis. The biallelic markers with two HLA alleles or two–residue amino acid positions were encoded as alleles 1 and 2. Multiallelic (three or more alleles) markers were encoded as the presence and absence of each allele of multiresidue amino acid positions.33 A log–likelihood ratio test, estimating the log-likelihood difference reflecting the effects at a single amino acid position, was used to evaluate the iMN association at an amino acid position. A logistic regression analysis was used to evaluate the association with iMN risk. Statistical analysis was performed using the chi-squared test for categorical variables. Gene interaction analyses were conducted by Fisher exact test. Statistical analysis was performed with the SPSS 13.0 software package (SPSS Inc., Chicago, IL). The amino acid sequence of PLA2R was extracted from Uniprot (http://www.uniprot.org/; identification Q13018). We used the SYFPEITHI online database (http://www.syfpeithi.de/) to predict the T cell epitopes of PLA2R. All predicted MHC class II ligands are 15-mers, consisting of three N–terminal flanking residues, the nonamer core sequence located within the binding groove, and three C–terminal flanking residues. Thus, anchor residue P1 appears in position 4 of the peptides predicted with SYFPEITHI.13 The protein crystal structure of 1YMM (http://www.rcsb.org/pdb/home/home.do) was used as a template to construct DR2b-peptide-TCR structural models using the Modeler program (version 9V8; http://salilab.org/modeller/).14–17,34 The crystal structures of 1A6A and 2WBJ were used as templates to construct DR3-peptide-TCR structural models using the Modeler program.35,36 Modeler refine was set very slow, optimization repeat was six, and ending model was set at 800. We moved the peptides step by step and sought the optimum structure. The conformations of 800 compounds were exported from every move and manually evaluated according to the following criteria. We measured the distance between amino acid residues of PLA2R peptides and corresponding peptide binding pockets at the first step (DR2b: distance pocket 1 ≤4 Å, distance pocket 4 ≤4 Å, distance pocket 7 ≤4 Å, DR3: distance pocket 1 ≤4 Å, distance pocket 4 ≤4 Å, distance pocket 6 ≤4 Å, and distance pocket 9 ≤4 Å). We chose the position with the shortest distance as the optimum position. Then, we measured the distance between the guanidino nitrogen atom of ARG on position 13 encoded by DRB1*1501 and the oxygen atom of the main chain of the residues located in pocket 4 and the distance between the side chain of LYS on position 71 encoded by DRB1*0301 and the oxygen atom of the main chain of the amino acid residues located in pocket 4. We set the distance below 3.5 Å and chose the conformations with shortest distance as the optimum structure. The authors appreciate the technical support provided by Ping Hou. Part of the analysis was performed on the Computing Platform of the Center for Life Science. This work was financially supported by Natural Science Foundation of China grant 81321064 (to the Innovation Research Group), Outstanding Young Scholar grant 81622009, and other programs grants 81330020 and 81370801 and National Key Technology R&D Program grant 2013BAI09B14. P.R. is a recipient of European Research Council ERC-2012-ADG_20120314 grant 322947 and 7th Framework Programme of the European Community contract 2012-305608 (European Consortium for High-Throughput Research in Rare Kidney Diseases). Z.C., L.-j.X., and F.-j.C. contributed equally to this work. See related editorial, “Genetic Complexities of the HLA Region and Idiopathic Membranous Nephropathy,” on pages 1331–1334. This article contains supplemental material online at http://jasn.asnjournals.org/lookup/suppl/doi:10.1681/ASN.2016020114/-/DCSupplemental.